Making barrettes with ribbon isn't as difficult as you might expect. While these pretty hair accessories often look very complicated, you can actually make several different barrettes in just one afternoon. Making ribbon barrettes is a great way to avoid wasting scraps of ribbon that are leftover from other craft projects, yet too pretty to simply toss in the trash. You can also recycle ribbons from gift baskets you receive by turning them into pretty hair bows. Little girls love hair accessories, but constantly buying barrettes to match every outfit in your daughter's closet can get expensive. If you frequently need to purchase gifts for young girls, handmade hair accessories are a great choice. They are inexpensive, yet sure to please. When looking for craft ideas to sell, you can't go wrong with ribbon barrettes. These items are typically among the best selling products at craft shows and on online marketplaces such as Etsy. Choose ribbons with bright colors and whimsical patterns or offer to create custom barrettes for your clients. Learn how to make a bow for your barrette. The basic process for making ribbon barrettes is quite simple, although you can create a variety of different looks by varying the size of the ribbon, the color scheme, the style of the bow, and the extra embellishments. 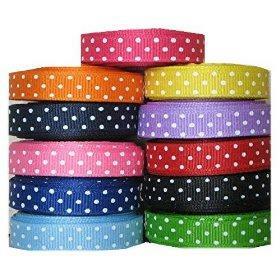 Apply seam sealant to the ends of the ribbon. Make a bow using the instructions in the LoveToKnow Crafts How to Make a Bow tutorial. Cover the metal hair clip in fabric glue. Center the bow on top, then press firmly. Let the barrette dry for at least 30 minutes. If extra embellishment is desired, try gluing buttons, beads, or small silk flowers to the center of the bow. 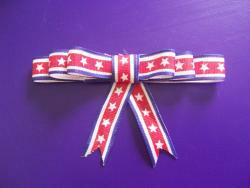 When making barrettes with ribbon, you may find that your creations are just too pretty to keep in a drawer. To proudly display your favorite barrettes, make a simple holder to keep them neat and organized. Cut your ribbon to the desired length. Glue it around the key ring. Apply seam sealant to the exposed edge of the ribbon, to prevent fraying. Clip barrettes to the ribbon, then use the key ring to hang your display on the wall.